No Limit Hostel Graffiti is located just a few blocks away from ‘La Sagrada Familia’ it’s the perfect place for people looking to enjoy themselves and have some fun! 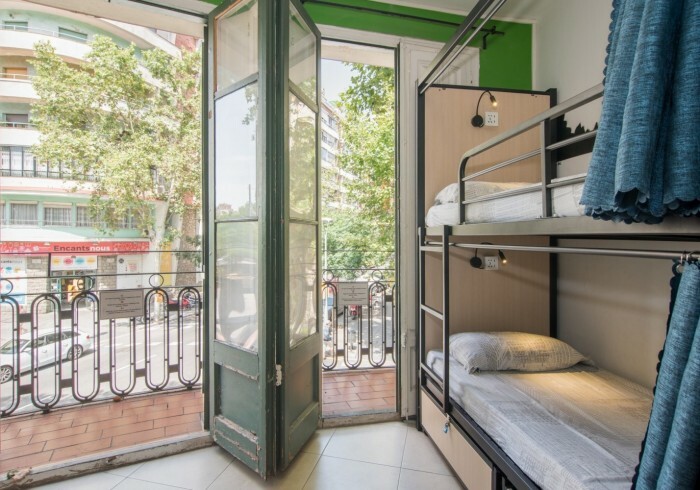 The hostel is large, clean & comfortable, and just 10 minutes away from the majority of Barcelona's biggest attractions. The closest Metro station is ‘Encants’ only 15 minutes from the city centre and 5 minutes from the ‘Sagrada Familia’. The hostel has been decorated exactly as the name implies: with graffiti. The different styled rooms are London, Berlin, Roma, Amsterdam, Dublin, Barceloneta. London and Berlin both have a capacity to accommodate up to 10 people while the rest have capacities of 8 people. All rooms have balconies overlooking the main street and safety lockers. Guests must bring padlock to use free safety lockers service. In addition to our laundry service we also rent blankets and towels. We have free Wi-Fi accessible from all areas of the hostel. Among other features we have a comfy TV room and two large terraces which allow you to connect with travelers from across the globe, great for a nice barbecue. These are just a few features that make No Limit Hostel Graffiti the ideal place for your visit. Feel free to have a look around on our website. If you have any questions or would like to make a reservation, we would be happy to hear from you! Towels rentals, and laundry service available. We offer security lockers for our dormitory room guests at no extra cost, however guests must bring their own padlock. The consumption of alcohol is prohibited at our hostel.